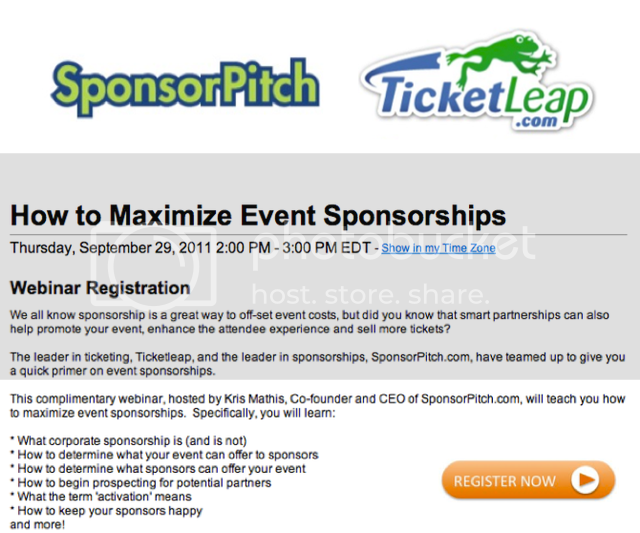 Today, we're excited to announce that SponsorPitch has teamed up with the guys over at TicketLeap.com to give you a quick primer on event sponsorships. After going over the basics of sponsorship, this webinar will take a look at the intersection between ticketing and sponsorship and discuss how structuring smarter partnerships can influence other aspects of your event, such as ticket sales. Please feel free to submit your sponsorship questions below in comments to this blog post and we will try to address them during the webinar's Q&A period. This is an introduction to sponsorship, but if we get a good turn out then we'll consider doing more advanced webinars in the future and may even feature other SponsorPitch members in upcoming ones so take a minute to RSVP your spot. There's no fee for this webinar, but space is limited.